Sports turf core aeration is probably the most beneficial service to promote overall health of your turf and playing fields. Core aeration of fields is recommended at least every other year. Core aeration relieves compaction, allows air, water, and fertilizer to reach the root zone. Aeration reduces thatch, promotes root development, disease resistance, and a thicker lawn. 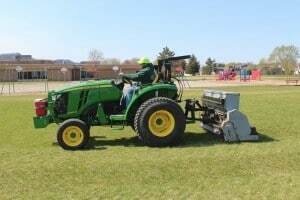 Deep Tine Aerators of sports fields is designed to penetrate deep into the soil to maximize water percolation, root growth, and air flow to the root system. With sports field deep tine aeration, a 4″-16” channel can be created every 2″-4″ inches on square. 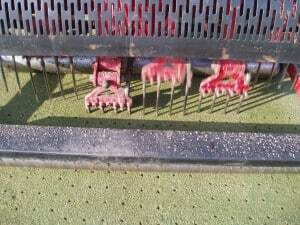 Deep tine aeration channels allow air to penetrate the soil providing the plant roots the required oxygen needed to thrive and grow. As new roots are developed this spring, the young roots enter these deep tine channels and can extend deep into the soil profile with ease. A deep and expansive root system will create a healthy plant, enabling it to withstand the heat and drought periods throughout the summer. While regular core aeration helps to maintain the field turf, deep tine aeration is far superior in promoting a healthy root system.